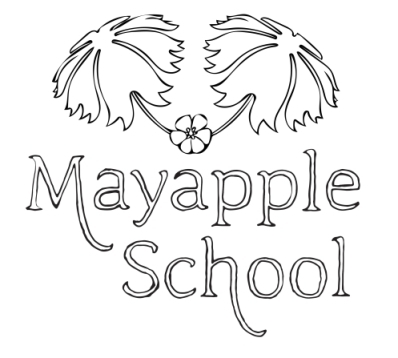 Recently, The Mayapple School moved over the mountain from its original home in historic Newport in Giles County to Blacksburg, Virginia. We were pushed out of Newport by The Mountain Valley Pipeline, a 300+ mile long, 42” diameter, high-pressure natural gas transmission line that is being built right behind our (now former) school building. Being within the “blast zone,” of this pipeline means that should an accident occur, the results would not include survival. So, we left. This was not a simple move. As a nature-based preschool, we deliberately design our program to nourish a connection to wild places; the development of a love for nature is at our forefront. Last spring, construction within sight of our school began, and the results were devastating. In two days, a wide swath of mountainside was hastily cleared, fallen trees lying one upon another in what seemed like senseless destruction. Clouds of smoke billowing from fires set nearby added to the sense of disaster, war declared on the earth we live on. Construction upstream turned Greenbrier Creek from clear to muddy, then back again. Each new proof of construction seemed like an assault. As a teacher, I knew I had a responsibility to my students who had so come to love “their” forest. We had created a culture where students saw themselves as creators, protagonists of their own story. Even when the students became interested in flying, I never told them, “You can’t fly.” Instead we delved into some of the ways people have been captured by the imagination of flight for centuries past, from kites to drones, and we flew through this experience. When students told me they couldn’t climb up a steep hill, my exact words of encouragement were: “You can do hard things.” With this attitude, students set about trying to solve this latest problem with ideas like: What if we built a fence around the trees… What if we told them we loved the trees and we don’t want them to cut them down… What if we plant some more… What if we told them they could cut six trees but they had to leave the rest…. It was heartbreaking to hear them ask “Why?” in such a way that you knew no answer could be good enough. 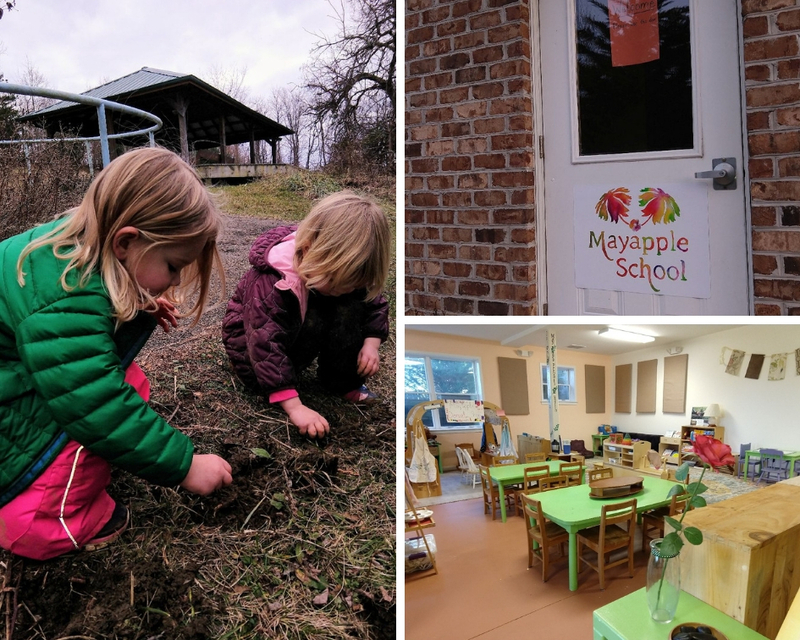 Like other early childhood environmental educators, at The Mayapple School educators subscribe to the philosophy that children first need opportunities to love the Earth before being asked to save it. Telling a young child about burning rainforests and other acts of mass destruction creates a sense of hopelessness and ultimately disconnect, as smart children (and they are all smart) realize that turning off the light when they leave the room and using cloth grocery bags is not, in fact, going to save the world. When Mayapple students were forced to witness first-hand environmental destruction of places they loved, I didn’t know how to make it OK for them, and I felt like a failure. When story time was interrupted by the buzz of chainsaws followed by the thud of a tree… again and again… I truly did not know what to tell the children. During this conference, I talked with Vermont educator Amy Butler about her experiences using nature to help children deal with trauma (having a massive flood destroy much of their town). I had also recently heard from educator David Sobel via e-mail who emphasized in his advice to me the importance of “vehicles for memorialization,” in helping children deal with environmental trauma. The Mayapple students also helped to show me what they needed themselves, through spontaneous song-making, drawings, and dramatic play. Somehow, we made it from that spring until our move and the opening of our new site just a few days ago. I was and am thankful for protestors, lawmakers, and questioning citizens who helped push against the Mountain Valley Pipeline, which has caused it many delays. Behind the school, virtually no more construction after the cutting of the trees has yet occurred, (although it has progressed further at other road crossings). This fall, we were able to enjoy what was left of “our” forest, rather than be continually faced with more devastation. This brief respite meant that our youngest students in their first year of preschool didn’t really know why we were leaving. As we prepared to leave, I wanted to shelter them from unnecessary knowledge of environmental destruction (as per the reasoning above) yet still address our older student’s feelings and everyone’s attachment. In addition to our activities the previous spring, we took pictures of our favorite places, made a point to say goodbye to each special place, collected rocks to take with us to our new school as reminders of the old one, showed students pictures of our new home, and planned many versions of students’ dream playgrounds for our new location. Students also participated in creating a video for fundraising for the move to our new location, which you can view here. Maybe I didn’t do everything right, and in fact I worry that we left with too great a sense of loss, that children felt unable to protect the place that they had come to love. But unexpectedly, our first few days here at our new site have held a healing sense for us, and I’m beginning to realize that our work of moving on might be just beginning. 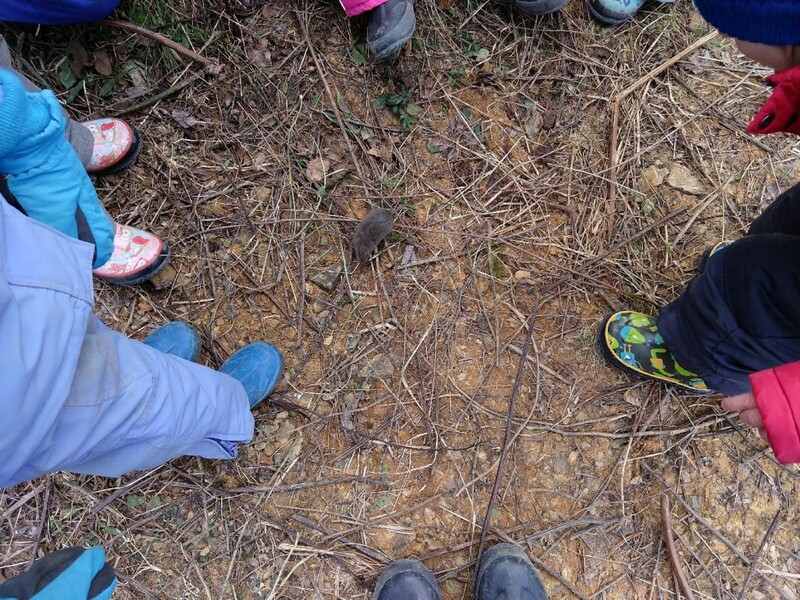 This first week at our new school, a meadow vole ran out from its home. Confused in the daylight, it ran around in circles around our feet, yet not a child screamed, chased it, or attempted it harm. As we stood in a circle talking about the vole, I watched the children watch this creature so different from them; I heard one say, “The meadow vole is our friend,” and I felt like maybe things would be okay. These children, embracing the world, open and ready to love, believe that anything is possible. And maybe, one thing I can do right is believe in that too.